Orangery extensions have become increasingly popular in recent years, giving customers the feeling of light and space of a conservatory but with the substance of a traditional extension. For some customers it is simply the look of an orangery that appeals. Internally the glazed lantern roof usually becomes the most stunning feature of the entire building, the phrase “wow factor” generally applies. The external appearance of the orangery can be designed to suit both the customer’s tastes and the local built environment. The range of colours, styles and configurations is limitless. 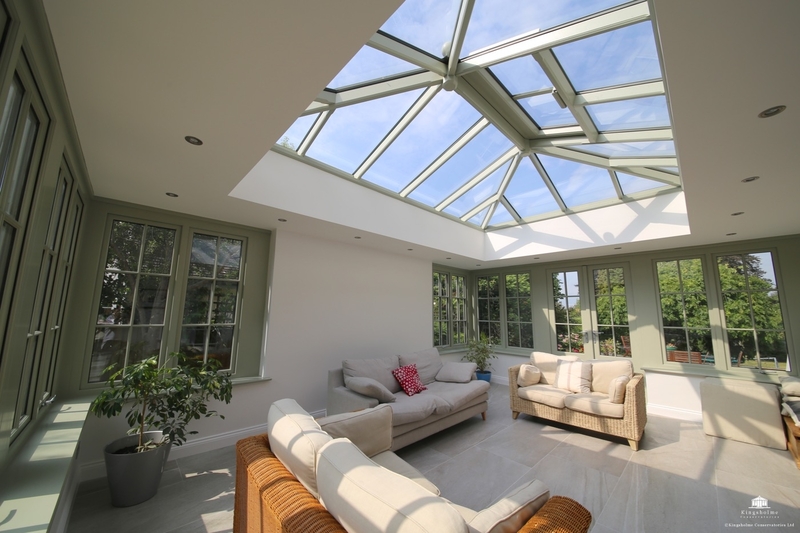 Our orangeries typically feature a hardwood roof lantern and decorative fascia with either hardwood or aluminium windows and doors. Occasionally uPVC is the most appropriate material for the windows in order to match the existing building, or on orangery extensions which feature a high proportion of masonry. We take care of the entire orangeryproject from concept to completion, from planning permission and building control approval, through to foundations, brickwork, creating new openings, plastering, underfloor heating and tiling. Our project manager is adept at ensuring the end result is preciously what the customer dreamt of. Each orangery we construct is bespoke and designed to meet the client’s individual requirements and to suit their particular location. Our clients can take full advantage of our CAD (computer Aided Design) expertise to see realistic 3D visualisations of proposed designs before committing to the project. Orangeries make superb kitchen extensions. They provide a greater degree of light than most traditional extension designs, but are generally more practical than a conservatory. We can manage the entire project, preparing both he new and original rooms, providing (services, electrics, plumbing and drainage) for the new kitchen and co-ordinating the installation with the kitchen specialists. This normally means we do all the hard work in advance, ready for the kitchen company to come along and install the new units and appliances with ease! It is often the case that we would lay the the final floor finish (tiles, wood, Amtico) after the new kitchen is installed, but occasionally is is better to do so before. The more important question is will it provide the type of living space you require? However some thoughts on the definition of a modern orangery can be found in this article what is an orangery?. Our orangeries are made using combination of traditional and modern techniques and materials, from steel, lead and timber to synthetic membranes, phenolic insulation and glulam beams. The vast majority of orangeries we construct are subject to building control approval. Whilst this may appear problematic to the uninitiated, we have the experience and expertise to make this a swift and efficient process. Building Control is a separate issue to Planning Permission, which may also be required and would be taken care of by ourselves. Orangeries typically feature areas of flat roof that need to be weathered with a product that is both aesthetically pleasing and durable; Sarnafil is unsurpassed in both areas. More versatile and practical than lead, but infinitely more visually attractive than felt, fibreglass or rubberised membranes, it is the choice of most reputable orangery specialists and large commercial flat roofing specifiers.